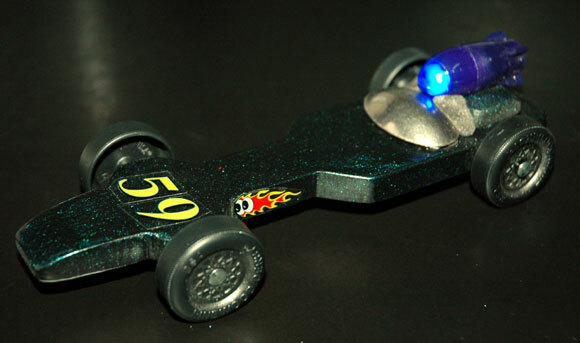 When I first got involved in pinewood derby racing, I bought every speed tip booklet on the market (not very many at the time). One of the booklets I bought, “What Every Parent Should Know about Pinewood Derby Cars and More” by Thad Marvin, stood out because of its focus on aerodynamics (and its trivial treatment of other factors such as lubrication and weighting. Even though I was somewhat inexperienced, I was skeptical that aerodynamics was truly that significant. One of the techniques touted in the booklet to improve aerodynamics was the implementation of turbulators. Probably like most of you, the word turbulator sounded like a made-up word to me. But I looked it up, and in a dictionary of technical terms, a turbulator is a device for improving air flow over a surface. 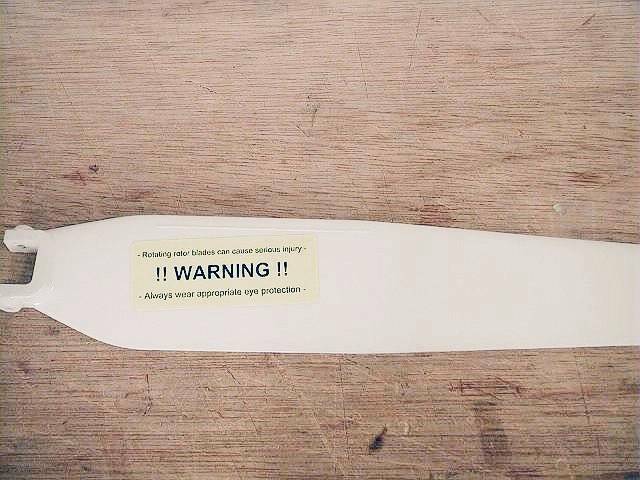 As air flows over a surface (such as an aircraft wing or propeller), the air wants to stick to the surface. As it leaves the rear of the wing, the air becomes turbulent, creating drag. However, if the air can be made turbulent before it reaches the rear of the wing, the drag is greatly reduced. So a ridge (a turbulator) is added to the wing to break up the airflow, creating turbulence before the rear of the wing. A similar concept is used on golf balls (the dimples). Generally, turbulators are used where air speeds are high, and weight is low, such as on a glider wing or a propeller. 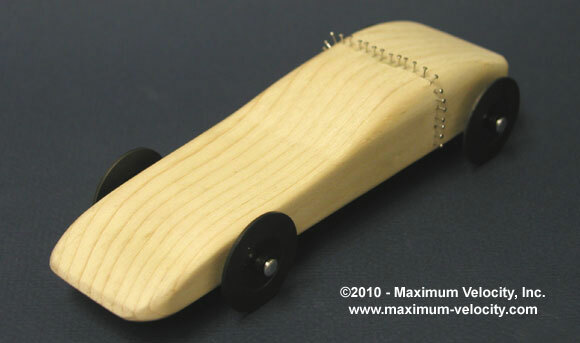 So, given the lower speeds of a pinewood derby car, it seems questionable that tailing turbulence is strong enough to affect the speed of the car. But let’s find out. Instead of using a strip like on the helicopter rotor, I used the technique described in Thad Marvin’s booklet. The turbulators are implemented as a row of pins along the high point of the car. I used a more traditional car-shaped body, as it would likely have more aerodynamic drag than a flat design. So, if turbulators help, they should provide more benefit on a fully bodied design than on a thin design. Ten heats were run with the turbulators. The pins were then pulled, and (to compensate for the weight of the pin) 0.015 ounces of weight were put into the underbody pocket (at the same relative location as the pins). Ten more heats were then run. With the turbulators, the car ran a 2.503 average time with a standard deviation of .003. Without the turbulators, the car ran 2.504 with a standard deviation of .002. The one thousandth second difference is less than the standard deviation, so it is not significant. The test was re-ran with a similar result. Volume 5, Issue 9, “Wind Tunnel Testing”. You can’t win no matter how fast your car is if it gets damaged at the stop section of the track. Our district track is a forty foot wood track with a three foot raised stop section terminated by a foam rubber stop bar across the end of the track. Unfortunately, the fastest cars slide through the stop section hitting the foam stop bar relatively hard. These fast cars either flip over the bar onto the hard floor, or hit the foam so hard that they bounce backwards through the stop section onto the track. Sometimes, the bounced cars collide with other slower moving cars, causing damage to all involved. In our second year of racing, my son’s car was the fastest in the first heat. His car slid through the stop section, hit the stop bar, and flipped onto the floor, bending a rear axle. Not realizing that the axle was bent we kept on racing and winning, only to have the car slow down in the finals. My son was fortunate enough to place third overall, but the other top cars were not so fortunate. Those cars also received damage from the foam stop bar, but ended up losing their top spots. After that experience, we decided a change was needed – brakes for the car. The brake system is very simple, just two small strips of 80 grit black drywall sandpaper glued to the bottom of the car in front of and behind the rear axle. This sandpaper causes the car to slow down quickly when it reaches the raised stop section. The deceleration is enough to keep the cars from bouncing on the stop bar. Now, we add brakes to all our pack cars going to the district race. At this past year’s event, none of our pack cars had a crash. Some cars using our Tungsten Canopy. Not only did I beat every derby car in the stock category, I took my car over to the pro stock track and had an informal race with the fastest cars of the night (all gravity driven). The winning pro stock car was owned by a man who said his car had never been beaten in a single heat in years of racing. We raced twice… I beat him twice! 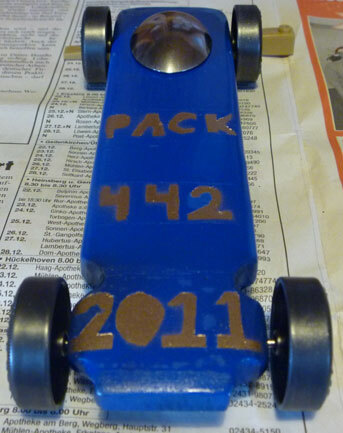 I helped a friend’s son (Christian) design and build this car that bested 200 cars last Friday and Saturday. He also won his individual pack on Thursday. He was so excited! Thanks for all you do. Our cars would be nothing if it wasn’t for your expertise and help. While buying supplies through Maximum Velocity for our second year of building Pinewood Derby cars, my son and I ran across the new “Vaccinator” kit. We both thought it looked pretty cool, and from what we learned of speed tips last year, we also thought it looked fast, so we chose to use that as a model for our design this year. 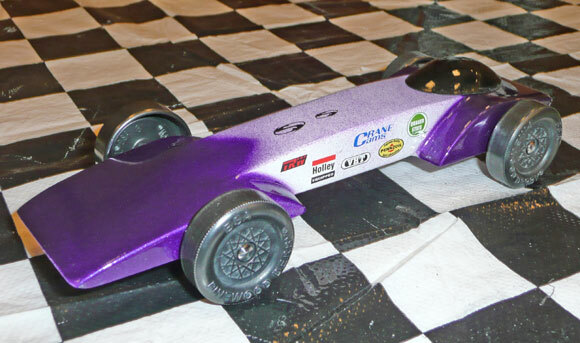 Since we’ve only been building PWD cars for two years, we don’t have the tools or experience to completely mimic the Vaccinator, but we chose to follow the principals of making it thin, carving the sides around the front wheels, and using Tungsten for our first time. The only weight on the vehicle is the Tungsten Canopy. After using lead last year, the switch to tungsten was immediately obvious and significant design improvement. We had a lot of fun building our cars, and Maximum Velocity has been a huge help providing our tools, designs, and weights to improve our competitive abilities and improve our father/son experience. Here is our winning car: stock axle spacing, stock axles – polished of course – stock BSA wheels, a Tungsten Canopy mounted sideways to maximize the center of mass at approximately 9/10 of an inch in front of the rear axle. The car won 12 out of 12 races so we are off to districts. What is the difference in the standard wheelbase and the extended wheelbase? Is one faster? Is the extended wheelbase legal? 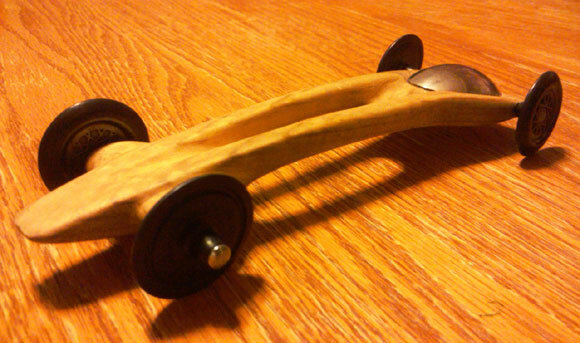 An extended wheelbase car has the axles mounted as far forward and backward as possible. This allows the added weight to be placed further back on the car, and also tends to allow the car to go straighter. Generally, extended wheelbase cars are faster than standard wheelbase cars. Many groups allow extended wheelbase cars, while others do not. So, certainly check your local rules for whether they are legal. I am not sure that I drilled my holes deep enough. Do you recommend re-drilling or should I just hammer/press the axles in the rest of the way? Can you please suggest the best method for installing the axles in the holes to ensure they go in straight? Drill the holes deep enough so that you do not pound them in. Generally, 3/4 of an inch in depth is plenty. Then, press the axle into the hole as far as you can with your fingers. Then put the axle head on our Axle Install Support tool. Hold onto the car and press down with a slow but steady pressure. 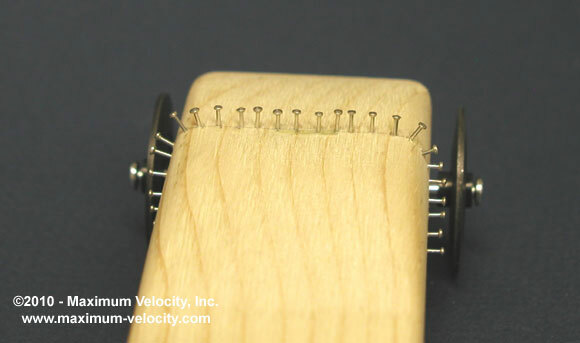 Make sure to use a gap gauge to set the wheel to car body spacing. Wheels that are turned on the outside have a smaller circumference. So a car with a larger diameter wheels will go farther per revolution than a car with smaller diameter wheels – correct? True, a smaller wheel will have to spin more times over the same course. So, the tradeoff is between accuracy and RPM. A trued wheel has to spin a little faster. But generally it is better to have a true wheel than an out of round wheel (which will start, and spin slower). Comparing a raw wheel (1.185) and a wheel trued to 1.170, the difference in revolutions over a 28 foot run is about 1.2 (91.4 for a raw wheel, 90.2 for a trued wheel). So the trued wheel has to spin just a tiny bit faster. Since the wheel is true, it can easily spin faster.